How do I change the frequency of emails? 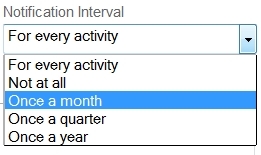 An email instructing you that it is time to complete an activity will be sent out on the Notification Date that is found to the right of the activity name on the Benefit Administrator dashboard. If you do not complete the requirement stated in the Action box on the compliance activity web page, Compliancedashboard will send you a reminder email to let you know this activity still needs to be completed. If you wish, you can congregate these emails into a single email that will be sent to you on a monthly, quarterly or annual basis. You also have the option of turning off this feature and not receive any emails. Warning: Changing the email frequency puts your organization at risk of not receiving important compliance reminders on a timely basis. Be sure to click the “save” button at the bottom of the page if you have changed any information.